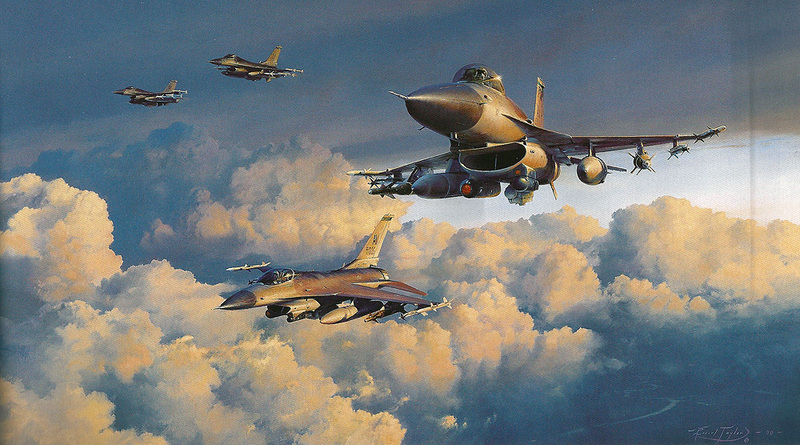 VIPER VENOM: F 16´s from the 31st (nearest) and 52nd Air Expeditionary Wings, as they climbout of Aviano air base in northern Italy, headed for southern Kosovo. 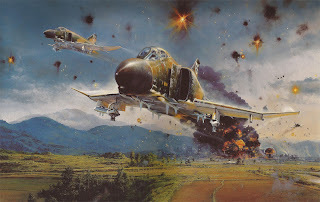 PHANTOM STRIKE: On 30 March 1967, flying the distinctive, classic F 4 Phantom, Robin Olds led a three-ship mission to attack the steel mills at Thai Nguyen. 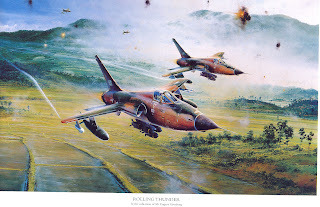 Seconds before reaching the target, Olds pulled up to 200 feet to release his 500 lb Mk 82 high drag bombs, his two wingmen following close behind praying that the ten second delay fuses would work which would allow them to release their bombs and clear before the lead´s bombs detonated. ROLLING THUNDER: Colonel Jack Brougton F 105 Thunderchief, 12 th March 1967 leading 355th TFW based at the Royal Thai Air Base at Ubon in Thailand on a mision to hammer the gun emplacemets surrounding the termal power plant at Viet Tri on the Red River located at a short distance NW of Hanoi. 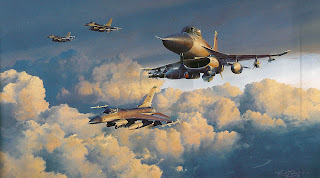 The bombing force get through and lay their bombs on the target. Cnel. Broughton and his three fellow pilots took the familiar route, approaching the target area flying down THUD RIDGE.